The number of apartments in the market is increasing, making the competition tougher than ever. Nonetheless, the occupancy rate in Phnom Penh remains below the mark. Based on a recent study by Bunna Realty Group, there were 292 apartment units in the market in 2016 – equivalent to 7,700 units, representing a 21 percent increase on the same period in 2015. There were 58 completed condo projects with a total supply of 5,400 units entering the market. Despite that, the occupancy rate of apartments has declined. The same study found that the occupancy rate of apartments has dropped from 90 percent in 2015 to 82 percent in 2016. 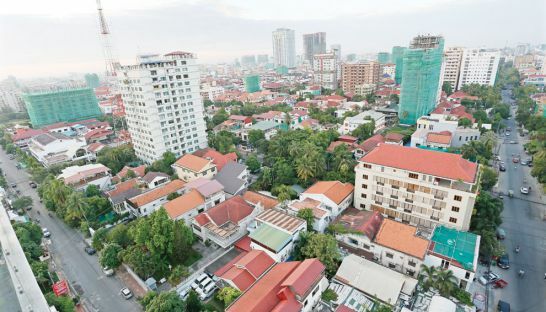 However, data from Bunna Realty strongly contrasts that from Century21 Cambodia, which found that the number of completed apartments entering the market last year was 220, the equivalent of 25,000 units, compared to only 184 apartment buildings in 2015. Chrek Soknim, CEO of Century21 Mekong, said the apartment occupancy rate is around 85 percent in the midst of this tight market, which makes developers opt to employ real estate management companies to reap benefits from the situation. According to Van Chanthorn, CEO of Town City Real Estate, the increasing number of condos in the market does not put pressure on the apartment market because of the different target groups each building focuses on. Thida Ann, associate director of CBRE Cambodia, admitted the apartment market was becoming noticeably more competitive as there were more new apartment buildings entering the market, making the rental prices more competitive. Additionally, all the latest buildings are equipped with modern facilities, giving customers more options. According to Ann, monthly rental fees of grade A apartments, which can be found in Boeung Keng Kang 1, cost around $1,500 for a one-bedroom. Two-bedroom apartments range anywhere from $2,500 to $3,000, while three-bedroom units cost $3,500 per month. A penthouse costs $5,000 a month.